In my last blog post I mentioned briefly some of the industries that use EPS foam. One I did not mention was the surfing industry. Surfboard technology has changed like crazy over the past millennia; starting with its humble beginnings in ancient Hawaii where surfboards would range from 10-16 feet and be made out of Ula, Willi Willi or Koa trees. Today surfboards come in all shapes and sizes and are constructed of very different materials. They usually consist of three parts; the core, the shell and material to bond the two together. Cores are commonly made out of Polyurethane (PU), Polystyrene (PS) and increasingly, our friend, Expanded Polystyrene (EPS) foam. Shapers, or the people who shape surfboards are generally fond of PU cores because of the materials compact nature and their ability to shape it. EPS cores on the other hand are very rarely hand shaped because of the materials brittle nature. They are instead manufactured by pumping the foam into predefined molds. Next the boards are covered in fiberglass and then coated with resin or epoxy based on the cores material type. Knowing which resin or epoxy to use based on the type of foam core your board has is of the utmost importance and I learned this fact hard way. As an avid surfer living in Hawaii, I get out in the water a lot, with this territory comes the inevitability that you will break, ding, buckle or crack your surfboards. Recently, I found a buckle, or crease, on my long board; strapped for cash and feeling in the DIY spirit I thought I would fix it myself. I thought by doing this I would learn some lifelong skills and save quite a bit of money. I WAS WRONG, VERY WRONG! The buckle was not deep and the internet informed me all I would have to do is cut out the fiberglass section above the buckle, fill it with resin or a mixture of resin and some filling agent and then finish by applying 1 or 2 sheets of fiberglass over the top. Sounds simple enough right? I found all the material I would need at the hardware store and preceded to "fix" my board. First, I successfully cut out the glass using a razor blade. Next, I mixed the resin with filler and poured it into my surfboard's open wound, making sure the resin was as smooth as the glass around it. The resin I used was UV activated so I brought it into the sun to let it harden. 2 minutes into this process I realized something was going wrong, instead of hardening the material was, I thought, being absorbed. 5 minutes go by and the resin is eating away the EPS foam core of my board. 10 minutes and nearly half the foam I started with was gone, PANIC! In 15 minutes I went from having a minor issues with my surfboard to having a severely damaged and very unusable surfboard. So what did I learn? First never trust the Internet! 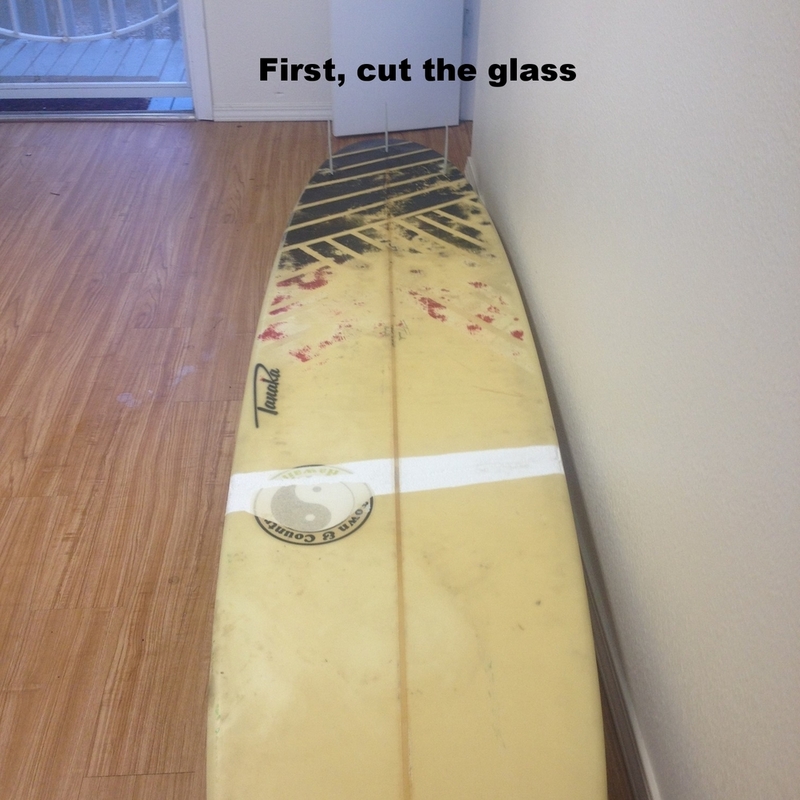 While the directions I followed were the correct procedure for fixing a PU surfboard, there was no mention of core type. I later learned that polyester resin generates a lot of heat while it is setting. EPS cannot stand up to this heat and melts on contact. The correct material I should have been using was epoxy. Epoxy is generates less heat when setting is the only material to be used when fixing an EPS board. Maybe my next surfboard will have a mycelium core? !